You've heard me "harp" on this subject before. This time I'm handing out pats on the back. There I wuz flopped out in (not on) my man-eating couch, proofreading a finished copy of Q-TALK #27 for the third time, when I was struck by something very satisfying. Starting on page 5, I saw a lot of "associating" going on: Kehler drove to Springfield, IL to visit Doyle and Weishaar; Graves visited Camarillo and thanked Jinx, Brock and Clark for their work; John Groff played "host from another coast" to Dennis Colomb and finally, Halloran flew down to Springfield, IL for a tour too. This is EXACTLY how I envisioned the QBA to be in its best form. I am delighted to be "associated" with you. Now I am never more delighted to be associated than when I am with the gang in Springfield, MO at what is becoming our traditional QBA Flocking. This was our third, and, according to my traveling mate Tom Moore, "the best one yet!" On first hearing it, I was surprised by Tom's short, enthusiastic summary. I have fallen into the numbers game trap. I was still expecting curb-to-curb fiberglass this year while we only had the same attendance as the previous two years (even our hosts seemed a little disappointed that there wasn't a larger crowd). What I failed to take into account was the QUALITY of this event. It was more like a good-sized backyard barbeque where everybody can socialize in depth with anyone they choose. Lots of good information was passed on in our "forum" sessions and when we poked and probed individual airplanes. While the weather was better this year, still a persistent wall of crud to the southwest screened out several planes in Texas and Oklahoma. Instead, Art Jewett came in from Kentucky and as Friday's sun brought the day to a close, Phil Haxton unloaded a pair of bloodshot eyeballs from the Q2 that struggled west from Atlanta through a constant and straining haze. On Saturday morning at the airport, I was pleased to find our group included several of the "new kids" that I've talked about of late. They were all ears. Jewett was busily paying back for all the rides he's gotten by giving rides in his very own FLYING Q-200. That was interesting. One rider Jewett took up was, like himself ... how do the suit salesmen say it ...ahhhh ...PORTLY! We all lined up to watch THIS takeoff. There was a sizeable ground roll followed by a visible stuttering at about 50 feet. We wondered. Shortly thereafter, a DC-9 on long final was asked to do a 360 while Jewett beat it on back in. What??? Art said his engine started running rough. Off came the cowling and out came the poking, probing and wrenching. What puzzlement. After enough time passed it was discovered that Art was distracted in his pre-flight. He has an EZ-type sealing fuel cap and after fueling up he set the cap in the hole without sealing it shut. He intended to get a finger full of oil to wipe over the rubber seal to keep it from sticking but he got distracted by an admirer and closed the filler door without doing it. About 50 ft. in the air and committed to fly the airflow created a suction on his fuel system and his engine started clearing its throat. Nothing like an up close and personal lesson for all of us! Back to that CD-9 for a moment. It turns out that Maury Condin who until this year was tower chief for Springfield Regional Airport is the builder and pilot of one of the Springfield-based Tri-Q's. He used to give irregular lectures to his tower staff on "Showing Undying Love and Affection to Incoming Quickie Pilots Who Just Might Turn Out to be Your Boss". We get good and equal treatment from the tower folks who nicely fit our flying activities in with the steady stream of commuter and air carrier traffic. We almost had a little bit of everything this year: An original Revmaster Q2, a Q-200 and three Tri-Q's. If Jerry Homsley could've gotten his stable of 2 Quickies over from Arkansas, we would've had a plane of each kind to salivate over. As it was, we did some detailed inspection of the ones there. I saw construction details on some of the planes that I hadn't noticed the previous 2 years! A highlight for me was Saturday night's group dinner in a fishing tackle store! I mentioned this INdamnCREDIBLE place last year. I guess you could call it a permanent convention center for sportsmen. Boats, guns, fishing tackle of every description, clothing, sneakers, waterfalls, streams in the floor, live fish, stuffed bear, sports art gallery, barber shop, auditorium, cafeteria and finally a classy restaurant are found here. It's huge. We ate upstairs then roamed the "mall" for shopping trophies. A very enjoyable evening. A very enjoyable weekend. Thanks to you Springfielders who host us and to the rest of you, y'all come up here next year and enjoy it with us, y'heah! Everybody pay close attention here because we have a switcheroo that will get you heading down the wrong trail. And don't give me any lame excuses if you do. It probably won't be in your program. FRIDAY, JULY 26, 8 PM, TENT #5 - The annual Quickie Builders Association Forum and general bull session (held in a general semblance of order by myself). SUNDAY, JULY 28, 1 TO 3 PM, HOMEBUILDERS CORNER, BACK PORCH - A semi-disorganized, small group talk session on builder experience and tips. Homebuilders Corner is located right in the center of the flightline just about in front of the tower and main entrance. Ask for directions. There are few strangers here. MONDAY, JULY 29, 1 TO 2 PM, HOMEBUILDERS CORNER, BACK PORCH - For those of you who just can't get enough, this fast-paced, hard-hitting and stimulating gabfest will fill your most craven need for Q-bull. I expect to be taking an aluminum tube into Milwaukee Thursday AM and should be out on the Quickie flightline by mid-afternoon. As usual, I'll be staying in one of the dorms at the University and that has not yet been assigned. I expect to have a backpack full of blazing red QBA T-shirts to unload. Art Jewett took a Tri-Q nosewheel mount and adapted it to his tailspring for the proper ground angle of attack. A nice and attractive solution to the problem. Here's a nice solution to preventing excessive pressures being applied to the tail bellcrank. Maury Condin's Tri-Q had this intermediate bellcrank mounted just aft of the split line. Note the two bolts serving as stop limits. After the damage from flipping N2QQ upside down in 1983 was repaired, a new series of test flights was conducted starting July 10, 1990. The tailspring broke during taxi testing. It turned out that the Aircraft Spruce tailspring purchased in '83 was laminated fiberglass by tightly winding UNI around a quarter inch O.D. wooden dowel (fibers parallel to the long dimension) to make a rod about 7/8 in. diameter. This assembly was then saturated with epoxy and placed in a small garbage bag connected to a vacuum pump. The bag was evacuated several times, re-coating any dry places with epoxy. The assembly was allowed to cure (no vacuum). After cure, the outside diameter was turned to a 3/4" finished size and installed using flox per plans. I have had more tailspring problems. First actual flight this time was on July 21, 1990. Had some overheating problems, but plugging leaks in the baffles helped. This Revmaster engine had an over-rev problem since new. The original propeller was a 56x45 Cowley. The tach was well past the red line on static runup. This prop was replaced with a 56x48 Warnke. It turned out that this was still not enough. Finally a 56x52 Warnke was installed. This prop would hold the RPM to 3500 on static runup and climbout. On June 15, after a nice flight, calm wind and clear, a very hard landing broke the right side of the canard at the fuselage! 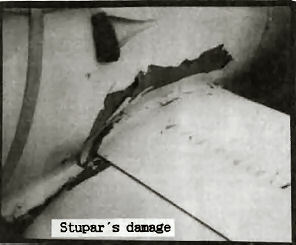 A full damage evaluation has not been completed as yet, but there is extensive compression failure of the canard center section and compression failure of the fuselage above the canard on the right side. I walked away without a scratch or bruise. Just a very sore ego and wounded dignity. ED. NOTE: Notice that while Max complains of a sore ego, it didn't stop him from sharing this bad experience with us in the hope it would teach others something. This is a thing I'm really starting to appreciate about you QBAers, the willingness not to hide but to expose your defeats as well as successes. I am now finally able to report some results on my flying. I have over 24 hrs. on my Tri-Q-200. I sit in admiration of you guys that are flying a Q-200 taildragger. The pucker and white-knuckle factors you have must be incredible. The Q-200 taildragger is a real stallion. Unfortunately, I'm not an experienced cowboy so I had mine gelded. The only negative I see to the Tri-Q conversion is that it does slow the airplane down. I have been flying in some rather hot weather, and mine appears to be flying about 15 mph slower than the tail dragger. I have not yet cleaned it up and put on the wheel pants and fairings. I hope this will give me some of my speed back. There are many things about this airplane that just gets me so excited that I can hardly contain myself. The one that for me is real fantastic is the picture I see as I turn to final on landing. I carry about 110 mph on final with 100 over the fence and when I'm over the numbers, I am rolling the airspeed back. In calm weather, I can slow this down slightly. Any time the wind is over 5-10 knots, however, I like to carry 110 down to the numbers. There is no question that Quickie Aircraft Corp. designed an incredibly exciting airplane. It is also very obvious that Scott Swing has done an excellent job in providing us with the Tri-Q configuration. For any of you people who are still having these large pucker factors with the tail dragger, feel free to call or write me. The Quickie 200 and Q-2 are incredible airplanes and they should not be left in the box or sitting in a hangar because you feel like they are too much airplane for you. I have found a way that I can gear up to that fast approach speed. I take a spam can out and just fly it right down to the runway at 100 or 110. Cessna's don't like to get very close to the ground at that speed, as some of you may well know. It is kind of interesting to feel the effects when you are that close to the ground with a Cessna. It attempts to push you back in the air because of the increased lift added by ground effect. Just one note about that tactic: Don't let your FBO catch you doin' it. It has been some time since I've contributed to these pages, so here are my bits and pieces. The most fun I have had in a long time is pulling my feet back and letting a friend take the stick. It took me quite a bit of patient testing including flying 140 pounds of computer paper, before taking a passenger. My first note here on the reflexor is a result of that work. I have decided to sell my Q-200. It is a hard thing to say, and I'm sure even harder to do. I seem to spend too much time and money on it for the time I spend flying. It needs a home with someone with more than 2 weeks of vacation a year, and a wife who likes to fly. Honestly, I'm not sure that I've ever decided that even I like to fly. However, I have had some peak moments in this and other Q-birds that I will never forget. I am a builder, and this one is beautiful. Here is some theory (ala me) about the reflexor, which should be a must on every Q-2 or Q-200. The reflexor gives these planes a "sliding envelope" (the fixed one you see in the pilots manual is supposedly without allowance for a reflexor). If you add "up" reflex (i.e. both ailerons move up which means the tail in flight goes down) this means that the rear wing will not carry so much, and in effect you have slid the envelope forward. On my plane I figure "O" up reflex is good for 2 - 160 lb. people, 40 lb. luggage and full fuel. 1/8" up reflex for 2 - 160 lb. people, no luggage and full fuel. 1/4" up reflex for 1 - 160 lb. person, 40 lb. luggage and full fuel (my test flying condition). 3/8" up reflex for 1 - 160 lb. person, no luggage and full fuel. What I am doing is sliding the envelope to center it around my weight distribution. If the CG is too far forward, you will find that you run out of stick before you get the nose flaired up high enough to land. The solution is to add more up reflex, thus lowering the tail, and giving the canard more flair authority. This state is easy to sense, as a lot of back pressure is required on the stick, but yet the nose does not come up. If the CG is too far aft you will find yourself coming in tail first on landings. You may also notice in cruise that the plane is overly sensitive to pitch changes, wanting to pitch up or down. In this case you may slide the envelope back to carry the weight by removing the up reflex, and thereby adding more lift to the rear wing. In addition (on a slightly different note), I have had a few experiences on final of the stick coming fully back in my hand without requiring a whole lot of force. What is happening here is that I am flying so slowly that I have stalled it. The solution, like in any plane, is to keep up the airspeed until low enough to flair. The canard makes this experience a quite forgiving one. A plug here is in order for "Stick and Rudder", an old bible, which explains stalls and such in a way I can bet some of you, like me, have missed out on. I believe I have set a record for the shortest flight in Q-200. I'm guessing the whole roll was about 1000'. I did have my wheels about a foot off of the ground when the engine quit, and there was a 35-knot headwind to shrink the distances a bunch. Well you might have guessed by now that I was not trying to set a record, so the people who might have been taking the measurements were not there. I can tell you what went wrong, and I must say I knew better for I had already rewritten about it in this newsletter (I think Scott wrote about it first). So I am now rewriting again that IF YOU HAVE A LOW POINT IN YOUR FUEL RAM AIR LINE, THEN SOONER OR LATER IT WILL FILL WITH FUEL, BLOCK THE AIRFLOW TO THAT SENSITIVE LITTLE ENGINE, AND MAYBE MESS UP YOUR DAY! I, for the record, had rerouted that line and forgot my earlier advice. It was full of gas (just because I can't figure how that could happen does not change fact). It is now AGAIN that downhill run that it should be. I'm not sure whether I've written about this one before or not, but from what others write they have not read it. When you put that little spring between the two rudder cables to take up the slack, you must do one more thing ... tie the center of the little spring to the tail spring (I used a cable tie). It changes about 1/2" of slop into less than 1/16". I won't try to explain the physics here, but if you will move the rudder back and forth while observing the little spring sliding back and forth you will understand. I have a neat way to make a low cost access door closure. It requires an AN 509 screw, K 1000 anchor nut, small piece of aluminum, wood and fiberglass. First step is to lay out the size opening you want. Add about 1/4 inch all around and cut on this line to remove the door. Duct tape around the edge of the door so fiberglass doesn't stick to the door. Now duct tape the door back in place from the outside. 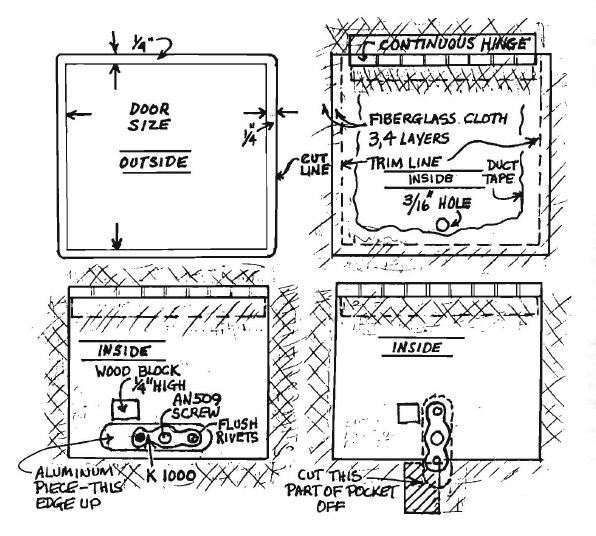 Lay up a couple of 1/2-inch strips of fiberglass on three sides of your door on the inside. Do not glass on the side where the hinge will be located. Lap 1/2 of the fiberglass material on the door and 1/2 on the structure. Apply Peel-Ply over the glass. This fiberglass material will form a lip so the door closes flush with the outside. When the glass hardens, pop off door. You will have a raggedy lip that will allow the door to open outward but will close flush with the outside. Trim this lip to about 1/4-3/16" on the three sides with a Dremel tool. Next fiberglass a section of continuous hinge in place on the fourth side. Now you should have a door that opens outward and closes flush. On the door opposite the hinge, drill a 3/16" hole about 1/2" from the edge and centered on this edge. Countersink this hole with a larger drill or a 100-degree countersink. Flush rivet a small (1/4 x 1") thick (.050) piece of aluminum to the K 1000 anchor nut. When the aluminum piece is attached with the screw through the hole and turned sideways the door should open. When turned the long way it should pull up snug and hold the door closed. Loosen up the screw and apply 2 or 3 layers of duct tape around the end that holds the door closed. Now apply 3 or 4 layers of fiberglass over the duct-taped end as it is holding the door closed and Peel-Ply. Attach a small block of wood with resin to an area, which would hold the aluminum piece sideways, as you unscrew the AN 509 screw. When the fiberglass hardens cut out a notch with a Dremel tool that will allow the aluminum piece to rotate to the sideways position as you loosen the screw. If you twist the end of the aluminum piece it will ride up over the lip and lock in the little pocket you have formed with fiberglass. When you unscrew the screw to open the door the aluminum piece will finally rotate and stop at the small block. The door can now be opened. Locking the door is a matter of loosening the screw a little and then closing the door and tightening the screw. The aluminum will slide up into the pocket and further tightening will lock the door closed. Another hint is to lay up your fiberglass up dry (as opposed to wet-all the glass fibers have picked up a little resin) put Peel-Ply over your lay-up. Then put old foam rubber over the Peel-Ply. The next step is tricky. You must apply even pressure to the foam rubber. I use plywood and weights or bracing from other parts of the aircraft. This applies pressure to the plywood, which transmits the force to the foam rubber. This acts like vacuum bagging and will make a lighter piece or addition to the aircraft. The foam will stick to the Peel-Ply but the Peel-Ply will pull off clean from the fiberglass. You can put Saran Wrap between the Peel-Ply and foam but it is a little slippery. This method prevents those glass needles and makes a smooth transition at the edge and is lighter. I have at least 4 (maybe 6) of the Q-200 tires, tubes, wheels and brakes (brand new). I'll take $25.00 each. Several people have expressed interest in the electrically adjustable sparrow strainers on my TRI-Q200. This system allows for pitch trim. It is probably as light or lighter than the usual mechanical linkage trim systems and takes up much less space. My installation has been both effective and trouble free. I find that with this system that I typically use the trim switch to "fly" pitch probably as much as I do the stick itself. I used the "MAC Trim Servo" (616-598-0592). My installation includes 2 Servomotors, a 3 light indicator for trim position, and a rocket switch to control Servo travel. I think that I paid close to $150.00 for everything. I used a single control switch wired in parallel with the Servos in my system. I installed the rocket switch in the console just ahead of the stick where it can be reached by extending my finger without releasing the stick. This switch can also be mounted in the stick grip if desired. The installation is fairly simple. An aluminum plate is fashioned to form an arm to actuate the sparrow strainer. 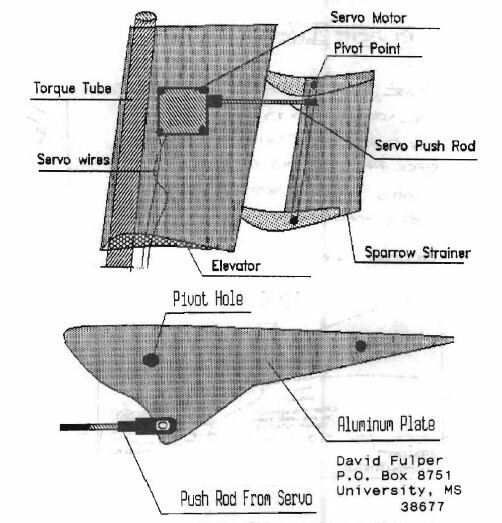 The sparrow strainers are then mounted between the sparrow strainer brackets (attached to the elevator) and allowed to pivot on a bolt placed through the bracket and into the sparrow strainer (see drawing). Determine where the Servo needs to be positioned inside the elevator in order to align with the sparrow strainer bellcrank. (Keep the push rod in line with the ram coming out of the Servo.) Remove the glass in this area (bottom of elevator) and lay up a couple of layers of BID in this excavated area for reinforcement. Attach the Servo in elevator using 4 counter sunk screws through the top skin of the elevator. Run the wires for the indicator lights and Servomotor out the end of the elevator near the torque tube. I used a Molex type plug at the fuselage to facilitate elevator removal. Attach the push rod to the Servo and the sparrow strainer and make sure that everything works without binding. When satisfied, the bottom of the elevator can be closed either with a removable cover or permanently by glassing over with BID. The length of the push rods can be adjusted to position the sparrow strainers and to synchronize them with the indicator lights. Make sure that the elevators are rebalanced before flying. Comments: Make sure that you inspect your installation for wear and tear regularly. If the push rod system fails, trim tab flutter is possible. 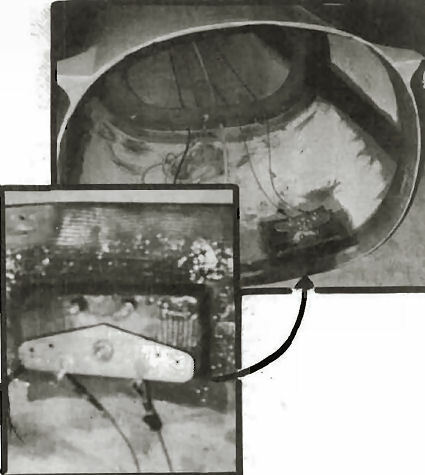 Moving the sparrow strainers out of the prop blast would probably decrease the amount of trim change needed with power changes but could also complicate the installation. If you do move the sparrow strainers outboard, make sure that the Servos will fit in the thinner and more narrow ends of the elevators before you start cutting or glassing. You can order a PDF or printed copy of Q-talk #28 by using the Q-talk Back Issue Order Page.